Everyone is looking for that perfect Father’s Day gift. However, you may have shopped the aisles of your local department or discount store, trying to find the right present, only to be disappointed by all of the generic Father’s Day presents that are available. If you want to really impress Dad this Father’s Day, then making him a homemade gift, will be something that he will cherish for along time. Personalized Father’s Day T-shirt-While there are many ways to decorate t-shirts, the finished project can look very professional. In addition, since this method doesn’t involve hot wax, it’s perfect for kids to do. Directions for the project: The first step to making this homemade Father’s Day T- shirt is to thoroughly mix two cups of white flour with enough water to give it the consistency of thick glue. Make sure that you remove any lumps, and spoon the mixture into a squeeze bottle. Place a sheet of cardboard inside the T-shirt to protect it during the decorating process. 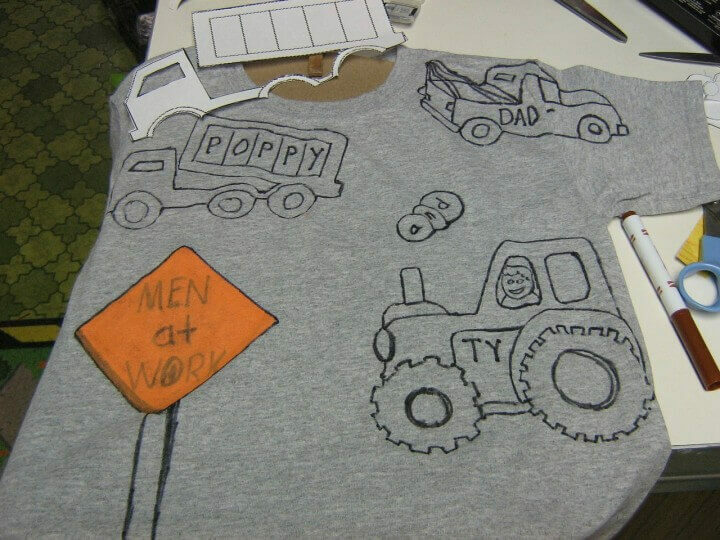 Have your child practice drawing designs with the squeeze bottle of flour paste on a sheet of paper or a scrap piece of cardboard, and then have your child make designs on the Father’s Day T-shirt. 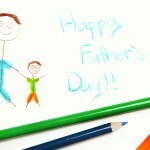 You could have your child come up with his or her own designs or phrase, or they could simply make a Father’s Day statement. The words “Greatest Dad” would make an outstanding statement on this fantastic Father’s Day T-shirt. After drawing with the flour paste onto the Father’s Day T-shirt, allow the T-shirt to sit in the hot sun for a few hours or until the flour has hardened. After the flour has hardened completely, pour the fabric paint into the spray bottles, and your child can spray this decorative Father’s Day T-shirt to create a fantastic multicolor design that surrounds a special Father’s Day message. Set the T-shirt aside until the fabric paint is completely dry. After the fabric paint has dried, remove the sheet of cardboard that was placed between the front and back of the T-shirt. Your child can peel off the dried flour. Wash the T-shirt using laundry soap and cool water, and dry the T-shirt as usual. 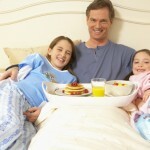 Your child now has a homemade personalized Father’s Day T-shirt to give to his or her special father on Father’s Day. Picture puzzle-This six-piece desktop decoration showcases family photos on two sides when it’s assembled and doubles as a brainteaser when Dad needs a distraction. Directions for the project: The first step is to paint the sides of each cube, leaving the top and bottom bare. When they’re dry, arrange them in a rectangle, unpainted sides up, and wrap a rubber band around them to hold them together. Using the marker, trace the rectangle onto the picture side of each photo, making sure everyone’s faces fit within the rectangle. Apply a double-sided adhesive sheet to the back of each photo and cut along the tracing lines. Peel off the adhesive’s backing and adhere one photo to the top of the cubes and one to the bottom (since it’s a bit tricky, it’s a adult’s job). Divide the photos by cutting along the edges of the cubes with the X-Acto knife (another job for an adult). Add letter stickers to spell out Dad, if desired.